Finding space to store hanging and folded clothing can be tough if collections don’t sell well or you have access to less than ideal conditions. Why not use garment storage racks in either case? Experts say it can save you more space than using boxes ever would. Read on to learn about some that can meet this need better than others on the market. To ensure optimal space savings with traditional stationary units that have an open or closed back, users can stand them against an empty wall. It creates an organized and clean look around the perimeter while maximizing footprint efficiency. More contemporary mobile systems compact while sliding on floor tracks, allowing retailers to store more in less space. Facilities then have up to 50% more capacity to organize profitable inventory within the same space. Others that have a multi-level design span floor to ceiling to maximize underused vertical space. Available configurations can have simple, yet durable static construction or more complex but flexible designs. The garment storage racks have the durability and versatility to store hanging and folded clothing found in many environments. This includes retail, school sport and music programs, museums, and first responders that need easy access to gear in an emergency. All can depend on these efficient solutions to provide flexible space savings while keeping everything accessible and organized. Whether you’re looking to store hanging or folded clothing, garment storage can present universal problems during use in commercial spaces. Being able to identify and resolve an issue could mean the difference between income growth and loss. So, take time to read through a few and what you should do to fix them. Once vibrant garments can begin to fade or look discolored if you over or misuse ordinary laundry liquid staples such as bleach, fabric softener, detergents and more. Understanding what cleansers work best to remove stains can help you avoid doing irreversible damage to textiles. While some could allow you to rewash damaged garments, others do not. Any success you have during removal depends on how old the discoloration is and past storage conditions. If holes or fabric damage exists, you could have an insect, rodent, or mildew problem. To eliminate mice or moth damage, first vacuum and launder garments according to the care label. Then, spend some time inspecting the storage area to locate critters as well as potential points of entry. Clean and repair the space, taking precautions to keep mice from re-entering in the future or have an exterminator treat the area with proper insecticides. What should you do if mildew has set in? Rewash clothes that have unpleasant odors with fabric safe detergent or bleach. Give storage areas and items time to dry before putting everything back. To prevent mold and odor growth in the future, air out the storage area. Suspend everything from athletic uniform jerseys and pants to retail prom gowns or museum costume collections from suitable hangers. Since not all hangers provide the same degree of support, choose one that fits the clothing style and weight. Place dress slacks or pants on a hanger’s horizontal bar that has a padded or enlarged and rounded look to prevent creases at the thigh. If hanging ready-to-wear dresses and skirts, use tape-made loops found at the waistline. They help distribute clothing weight and minimize damage. Leave enough space between clothes to ensure clean air circulation, easier access, fewer wrinkles, and damage. If you must store anything in boxes, roll it first rather than folding it. You should line the area with acid-free tissue paper to allow easier handling in the future. Always support the item inside the fold forming a “C” to prevent creasing. Keep fragile textiles in specialized bags with easy-to-secure zippers that help keep dust, moisture, and pests out. Avoid hooks which have limited use. Our garment storage racks have many benefits that set them apart from others on the market. 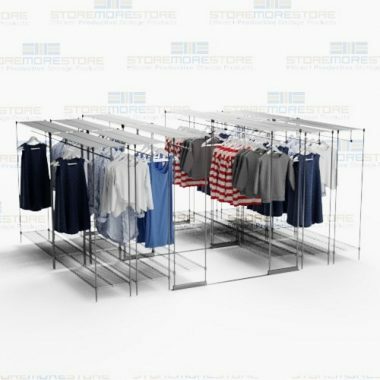 Choose from six affordable and efficient options designed to store hanging and folded clothing found in many commercial applications. This includes small and large business retailers, schools, museums, apparel warehouse manufacturing facilities and more. All include features to help these environments protect their material investment. Some have flexible shelf space to fit extra inventory or can expand to meet growing departmental needs. One even meets ADA compliant regulations to promote inclusive access and use among able-bodied and disabled populations. This is an easy-to-install high capacity wire shelving solution that users can move along non-corrosive, low-profile ADA compliant tracks to save space. Units include a sizable hanger rod that staff can integrate with hangers to ensure safer material access. Systems have attractive chrome-plated posts and allow facilities efficient expansion flexibility to accommodate growth. Keep items that resemble one another together to create a more organized, clean display and simplify material retrieval. It looks more appealing to the public eye and helps speed personnel search efforts during month-end sales pushes. Systems include adjustable sanitary wire shelving flexible enough to keep folded clothing safe from dust. Configurations can have rolling shelf lengths up to 12′ long to maximize space efficiency in the available footprint. These durable steel-made cabinets allow personalized customization during design. For instance, experts can add security locking doors to prevent theft or drawers to store folded items and more. Choose from single or double-tier configurations with durable closed uprights. All have components that allow users full adjustability to customize the compartment space. 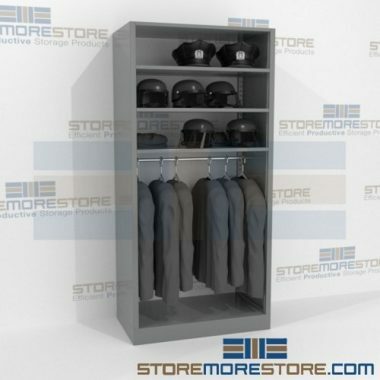 Use the interior to safeguard and organize everything from athletic jerseys and helmets to police and fire service uniforms. Configurations have kick plates to prevent items from rolling underneath. Its attractive powder-coat finish resists scratch marks and rust, keeping units clean. Every model provides efficient protection against dust to keep stored apparel clean, ensuring its safe to wear whenever needed. This includes times when students have pre-game pep rallies and end-of-year sports award banquets to attend. Others could involve military or police personnel that need a sturdy solution to accommodate annual formal ball or ceremonial attire. 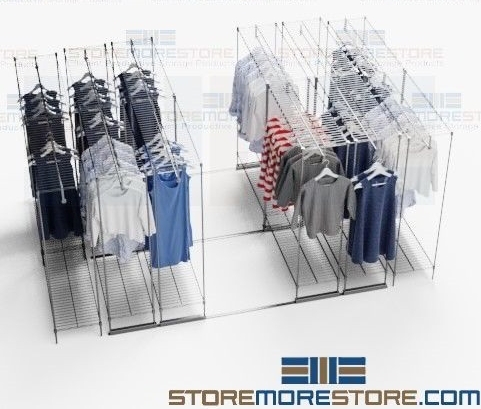 These single and double-sided garment storage racks allow you to stack inventory smarter using vertical space. Warehouse staff has safer access to the floor and efficient space to store items. Units provide either two or three levels of space that users can change to ensure safer material handling during storage and retrieval. Personnel can see organized items better and find what they need without error. This can lead to more efficient order fulfillment and help cut labor costs. Facilities still meet consumer demands while saving money and have the floor space to increase productivity. The open design allows better accessibility and efficient airflow to keep organized inventory clean. Wire garment racks are available with or without casters that allow space-saving relocation flexibility in moments without adding unwanted noise or marking up the floor. The units have a sturdy hanger bar to support hangers holding physician lab coats or band jackets. 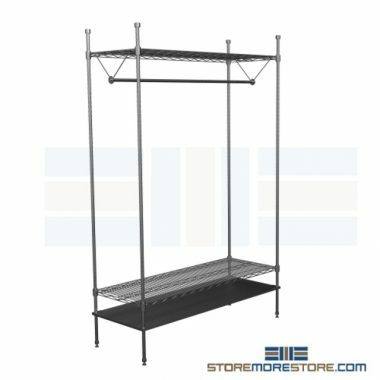 These static or mobile garment storage racks have flexible shelf space to store hanging and folding clothing in one place. Keep the versatile solutions in a cool and dry location during nonuse to limit rust, heat, and light exposure risks. Rather than place surplus apparel right on the wire shelves, roll everything in more efficient containers to prevent snag damage. 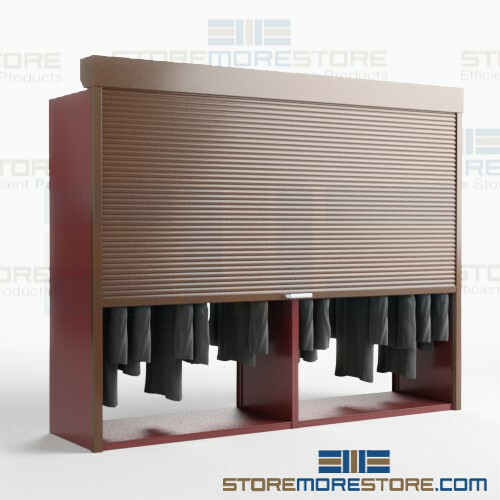 It provides added dust protection while allowing the space to look clean and organized. If you need more space to stack the bins underneath, simply adapt the shelves to the desired position. Leave enough room in between the shelf levels to ensure users avoid injury during material access and retrieval. These gowning racks include removable hangers and a polished look that provides better corrosion protection. System surfaces endure less stress, helping minimize wear and tear that costs money to repair. It reduces cleaning time too, allowing users to engage in more productive activities. This could include reorganizing stock displayed on the sales floor or mending costumes that student performers need to wear. Quality steel-made locking cabinets can fit security roll-up doors to help prevent theft. It keeps dust and light out too, allowing choir concert robes and other clothing avoid deterioration due to harmful environmental factors. It proves the systems would do well in small-budget facilities. This includes public and private schools that often have concerns about property damage and loss due to limited or no security. To protect these wardrobe items and more, learning spaces control access using a standard key lock or electric remote. Academic athletic departments keep equipment safe and clean, preventing students from raising funds to afford new gear. Garment storage racks are available to buy online with a variety of options and free dock-to-dock shipping included. If you need any assistance or just want some help picking the right solution for you, please call us at 1-855-786-7667. Customers often ask employees to check for out-of-stock items in “the back.” Unfortunately, many retail backrooms are cluttered, disorganized, and difficult to navigate. But with limited amounts of space, retailers don’t have many options when it comes to storage. Sliding mobile garment racks are an easy way to instantly increase storage space with one simple solution. What takes up the most space in your backroom? You might have already noticed that the aisles between rows of shelving and racks take up a significant amount of space. Additionally, employees don’t need to access all aisles at the same time. For the most part, no one is using a great majority of the shelves at any point. 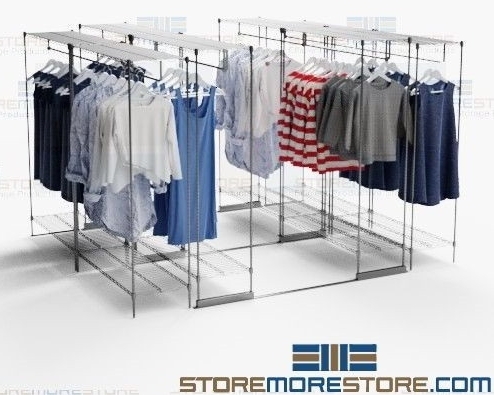 By mounting wire shelving on floor tracks, the sliding mobile garment racks eliminate the need for this extra space. When not in use, the racks remain compacted together in a small footprint. Employees simply slide the shelves across the floor tracks and open an aisle where it’s needed. This means that there is no extra space wasted, and employees can still access the storage area easily. And if you decide to expand the system at a later date, it’s easy to add additional shelving units. 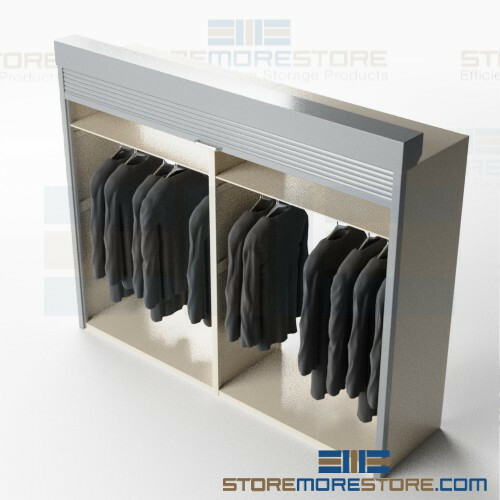 The sliding storage racks are great for retail backrooms, lab coats, costume storage, choir robes, uniforms, and much more. 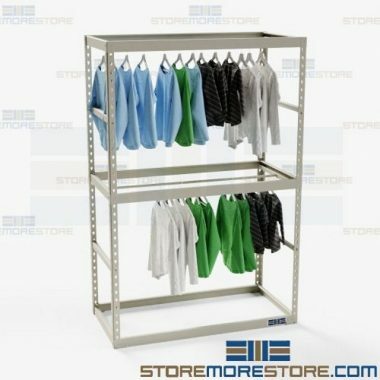 Sliding mobile garment racks are available to buy online and ship within 7 to 10 business days. Free dock-to-dock shipping included. If you need any assistance or just want some help picking the right solution for you, please call us at 1-855-786-7667. 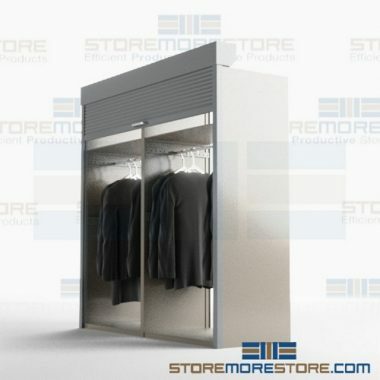 Hanging garment cabinets are a durable and professional storage solution for storing all types of clothing efficiently. The cabinet’s hanging rod provides neat storage for gowns, robes, coats, suits, jumpsuits, and other clothing and uniforms. Additional space above the rod provides storage space for items such as helmets, hats, and other items. For more security, roll-up locking doors are easily added to the shelving units. These doors protect stored garments from theft, dust, or other exposures, which makes them great for museum, office, commercial, or industrial applications. For enhanced ease of use and user safety, motorized door options are also available with a variety of locking options. Users can roll up the door and access their items with the push of a button. And with an automatic sensor, the door movement automatically stops when it contacts an obstruction. This keeps users safe from injury and prevents damage to garments stored in the cabinets. Hanging garment cabinets with optional roll-up locking doors are available to buy online and are eligible for volume discounts. For further assistance, give us a call at 1-855-786-7667. One of our storage experts will help answer all of your questions. Rotary cabinets are becoming more and more common in offices for storing files and supplies, but did you know that there are multiple configurations of these innovative cabinets that have an even wider variety of uses? Rotary cabinets can also be used as spinning wardrobe towers for personal and office workstation station storage as well as double-depth storage cabinets for personal protection equipment in industrial, healthcare, and emergency applications. To access either side of the cabinet, simply press on the ergonomic pedals and rotate to the storage side you want to access. Rotate again to close and lock the cabinet. With adjustable shelves, the rotary cabinets allow you to store all types of equipment safely, securely, and within your industry standards. 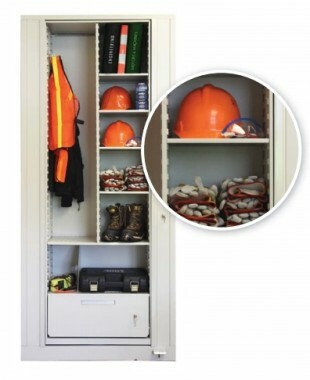 You can store hard hats, safety goggles, gloves, small to medium tools and parts, safety vests or aprons, boots, binders, testing equipment, records, medical emergency and first-aid equipment, and much more in even less space than static shelving or lateral cabinets. With office storage space at a premium, the rotating wardrobe towers allow you to double your storage capacity in half the space. For example, you can store employee personal items on one side of the unit, and work-related materials on the reverse side. The unique design allows employees to hang their coats and garments while still having enough room for other personal items such as purses and tablets. 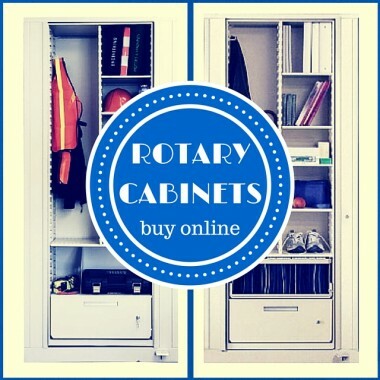 Rotary cabinets for your unique application are available for purchase online at StoreMoreStore. If you need assistance with deciding which rotary cabinet would work for you and your specific application, give us a call at 1-855-786-7667. Everyone that’s ever worked in or participated in theater knows that the creative spirit can sometimes be messy. You also know that costumes are expensive and budgets are usually small. But the costumes are a huge part of the story you’re telling. How would you know it’s a Shakespeare play if everyone was dressed in modern clothes? Keeping all your costumes preserved and organized is essential – and easy to do with the garment racks. Just like theaters, churches typically operate on small budgets. Most of the money raised gets put back into the church itself or gets put to use through charity work. You need to make sure your church choir robes last through multiple performances and many people wearing them. Storing them hanging on racks ensures they’re safe from damage. Kids are rambunctious to say the least. And they’re also prone to accidents. The phrase “don’t run with scissors” isn’t said for nothing. Keeping jackets and coats out of the way in the classroom helps to prevent any kind of tripping hazard. While the big-boys in the museum world might get all the attention, small community museums are what preserve local history. They play an important role in keeping us informed about what’s happened in our towns over the years. Part of that history includes the clothing and dress of generations past. And since these types of garments are so sensitive, you can’t just leave them piled in a corner. 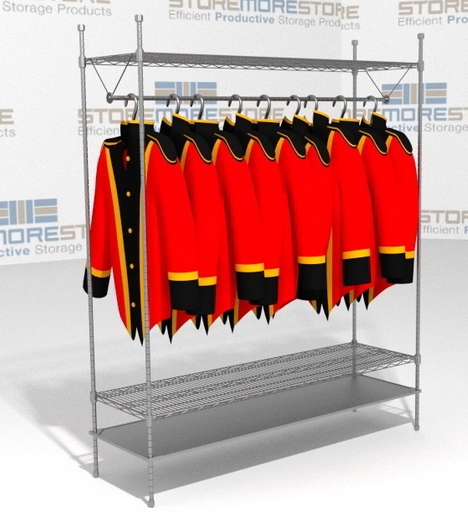 The garment racks are an excellent solution since they are right-sized for your small museum. Working in a research facility or clean room, you’re going to have a lab coat. And making sure it’s there when you need to put it on saves time and helps you do your job. 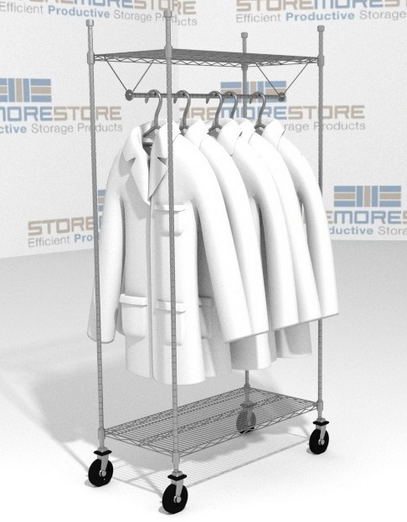 The garment storage racks keep your coat closer to the point of use so that you can focus on your job, not searching for a missing lab coat. 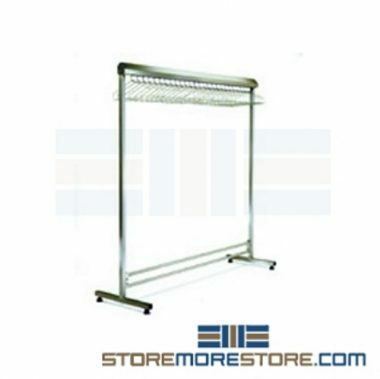 If you need a garment storage rack, you’ll find our large selection here online. And if you need any help picking the right one or have any questions, please don’t hesitate to give us a call at 1-855-786-7667.